Welcome to Old Town Home! Hello and welcome to Old Town Home. We're Wendy & Alex, two long time DIYers who happen to have a love of old homes, an appreciation for a job done right, and some crazy ideas of what we can handle ourselves. If this is your first time on Old Town Home, or if you've found yourself here several times and want to learn a little more about us, we've put together a guide that will help you to start navigating our website. And remember, if you follow a link to another section of the site, you can always get back to this page by clicking on the "First Time Here?" link to the right. Even though we begun our renovation in 2003, we're somewhat new to the blog scene having started Old Town Home in April of 2011. In this short time, we consider ourselves fortunate to have met so many fellow DIY and design enthusiasts, and have even been lucky enough to have been featured on Apartment Therapy, and in Old House Journal, Northern Virginia Magazine and The Washington Post Express. We were even a winner of eCollegeFinder's Top DIY Blog Award and a finalist in Apartment Therapy's 2013 Homies for Best Home Projects & DIY Blog. Though our blog is about our life and DIY adventures, the central character to this website is our 1880's Victorian row house. Starting with the "Our Home" navigation link is the best place to go. There you can learn a little bit about our house, the historic district in which it is located, and why it is important to us. Once you know a little about hour house, a collection of before photos is always fun to peruse. We took a whole bunch during our home inspection, and even we like to go back and look at them to see how far we've come. We are a couple of high school sweethearts who've been together since 1995, and married since 2002. We grew up in the Cleveland, Ohio area, went to school at Miami University (yes, the one in Ohio, no the weather wasn't always sunny and nice, and yes Miami was a school before Florida was a state), moved to Alexandria, just outside of DC, for work in 2000, and fell in love with Old Town Alexandria within weeks of our arrival. We were bitten by the DIY renovation bug when we realized the potential old houses held, the fact we wouldn't be able to afford a house that didn't need a lot of work, and the fact that we are a little bit Type A and can't stand when stuff isn't done "right." Just like any good contractor working on a house, we consider ourselves our very own construction crew. And to be sure nobody feels left out, our pets Mel and Lulu are all part of the crew too. Be sure to drop by our "About Us" page to read about each crew member (both two- and four-legged) that has a daily hand in this story. You know what they say, "Location, Location, Location!" 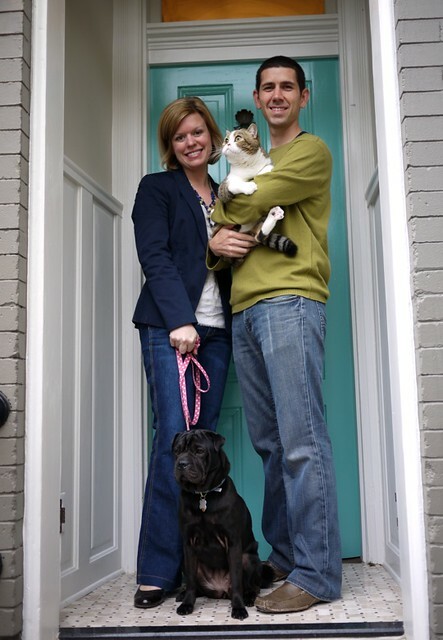 Shortly after we moved to the DC area we knew Old Town Alexandria was our place to be. We never lived in an urban environment growing up and we were fascinated by the idea of row house city living. Beyond the idea, Old Town Alexandria has everything you could possibly want: shopping, dining, entertainment, activities, proximity to a major city but still a small town feel, and it's all within walking distance. The homes and architecture are also unique and beautiful. In fact, Wendy is a licensed real estate agent in Virginia, and specializes in Old Town as well as the other neighborhoods of Alexandria. 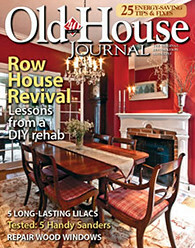 Old Town often takes center stage on the blog, and it isn't because we're trying to brag about it. We want our readers to know the kind of wonderful place in which we live so maybe they'll come visit someday and we can run into them during a farmer's market, evening out at one of our favorite restaurants, or at one of our many local parades. Since we put up new content every day, Monday through Friday (and even sometimes on the weekends), paging back through old posts can get a little overwhelming, so we've created a calendar page that shows each post by day. This page will let you look through each day's posts for the topics you are most interested in without having to click through tons of pages. Hopefully you'll find it extremely useful. Here at Old Town Home, we like themes. I'm not sure why, we just do. It doesn't matter if we are decorating for our most favorite holiday of the year (ahem, Halloween), or if we're watching the unexpected neighborhood window decor (dressing up toy llamas is all the rage you know), we like a good theme. Luckily, we have several recurring theme-type posts that just make us happy. We hope you like them too. Toolbox Tuesday - We love tools here at Old Town Home, and Alex really loves tools, so we try to write every week about a tool or two that we've had some experience with and we think might be particularly useful to you. Open Housing - We also love to visit open houses in our historic neighborhood, and play a little game we call "Would you trade?" As the name implies, it's a money no object option to trade our current home for the one we just toured. The results might surprise you. Ask Old Town Home - Where we answer your burning questions. If you have a question about any of our projects, need some advice on one of your projects, or are looking for some additional info on any of the random things we talk about, drop us a line. We link to many of our most significant projects, regardless of size under the "Projects & Tutorials" page (go figure). These include the various DIY renovation efforts we've undertaken, the quick items we've covered, and the things we are particularly proud of and have a burning desire to show off. We're constantly adding to these sections as we tackle more things in and around our house, so those areas should be changing fairly consistently. One thing we don't have right now is a very significant Before & After gallery (but we're working on it). Until then as have a simple post that should do a decent job in outlining some of the most significant changes our house has seen in a room by room fashion. One of the questions we get more than just about any other question when we tell people we live in a house that is 125 years old is "So...is your house haunted?" In no way are we saying "Yep, haunted house here, call in the boys from TAPS," but we have had our fair share of unexplained things that go bump in the night. Around Halloween we shared a few of these stories here on the good old blog, and one of them we even went ahead and loosely credit to the original owner of our home, Mrs. Bryan. We also shared a couple of incidences as they happened on our Twitter and Facebook accounts. We've got a few more tales yet to tell, but I think we're going to wait until next Halloween to tell you about those stories. But haunted or not, it doesn't really matter, it's all in good fun. This may sound a little odd, but among our friends, this is what we're known for. When we do things, we try to not only do them right, but perhaps even consistently and methodically overdo them. We're sort of the "It goes to eleven" type of DIYers. This fact is evident by our seeming need to strip paint from every surface of our home only to repaint, our relentless searching for years just to find the right set of doors or hardware to complement the period of our home, or the need to construct a DIY basement server rack and install computer controlled lighting throughout the entire house. Yes, we're serious, we did that, and we'd do it again. We hope we've properly thrown out the welcome mat for you and you feel like a virtual house guest of ours. We've been having a lot of fun sharing our adventures and learning more about all of our readers' experiences. It helps when we're taking forever on a project to know that our readers have been there, done that, and lived to tell about it. If you've made it to this point in our welcome, we're hopeful you'll be a new regular around here. After all, nothing makes a blog feel more like home than the friends that we see day in and day out. Putting in a request for a floorplan/scale drawing. I THINK I know more or less how all the rooms go together, at least on the first floor. But it would be nice to be sure. Looking forward to the Before & After gallery. My new favorite website! Lots of great information for house lovers! Thanks, Colleen! We're glad you like the site! I thoroughly enjoyed the article in the Post awhile back about your home & this blog. When my skateboarding son saw me swooning over your wrought iron front steps, he showed me a great photo of one of his buddies grinding another, less magnificent, wrought iron staircase in Old Town. The plan had been to just tag the steps then boogie, but the homeowner opened the front door in mid-grind. The boys thought they were in trouble until the older gentleman asked, "Are you taking pictures & video? Let me get my hat." And he returned, jaunty in his headgear, standing calmly in the doorway, while my son snapped away & his friend rode the old guy's front step for 10 minutes. I'd love to send you the photo if you'll e-mail me KateNerone@aol.com. Sidebar: one of my husband's co-workers just sold his big house in Clifton & purchased a townhome on Royal. He is in the process of intense renovation & I will share your blog w/him. His name is Bill Zana, & I predict he will become your most devout fan. Thanks! SUBJECT: View our Designing Spaces segment! If you didn’t have a chance to tune into Designing Spaces on Lifetime TV Friday, we’re here to help. Here is a link to the 5-minute segment that features our Mosser Lee and LabTech home testing products. You’ll see homeowners Michelle and Darren highlight the homeowner safety concerns that we hear every day from our customers. You can also see the peace of mind they get from contaminant testing and the ease of using our test kits. Michelle and Darren use our testing kits as an inexpensive way to determine that they have a safe home environment, free from water contamination, airborne mold spores and radon gas, plus Darren finds a way to assure that their new landscaping will have the correct nutrition to grow successfully. Have you requested a FREE test kit of your choice to use and review for your readers? We are offering it now through the June 30! Please reply to this email with your mailing address and the kit you’d like to test and review. We’ll get it shipped to you immediately. Thank you for your time and attention. Please enjoy the show and FREE test kit. We look forward to your review. Thank you for all the wonderful ideas and great information. Keep up the good work! We're glad you're enjoying the site. Thanks for the note. Thanks for a wonderful site--we also live in Old Town and have been living in our place for about 7 years. I'll keep reading! I love it when Old Town locals find the site. We are lucky to live in such a great place. Beautiful blog! Love it! Love your furry "apprentices" as well! Nice site! The pictures you guys have put up makes me want to start trying stuff at home but I'm too scared I'll mess up. Did you guys have have any worries like that before starting any projects? Hi! So I was poking around the Apt. Therapy Homie list and clicked on your blog not realizing that your Old Town is the Old Town where I grew up!!! 505 Prince Street. Now that I know the deal, I'll be checking in often. So fun. I got married at St. Paul's Church, played soccer at the Lee St. park and rode by big wheel around the courthouse fountain. I'm now up in CT and blogging myself (only 50 votes behind you!)... so happy to realize where you're coming from! Good luck with the Homies and can't wait to read more! Hi Charlotte - We're so glad to hear from another Old Towner! What a small world. :-) Good luck in the Homies, and we'll be sure to check out your site as well! Oooh, 505 Prince St. What a great place and great location! There's an apartment two doors down at 509 Prince St. that I always look at and wish we could own and renovate. We talk about Old Town quite often, so maybe we'll be your urban fix now that you're in the burbs. We sort of flip flopped. Wendy and I grew up in the burbs of Cleveland and Old Town is our first ever city experience (and we really love it). Good luck on The Homies to you too! Ha! I think my friend lived there growing up... we set up a mean lemonade stand on the corner. I'm jealous! Old Town is the perfect little city... a house with a yard? I mean c'mon. Can't wait to live vicariously (a drink at Vermillion would really being me back!). Fortunate to be in Old Town this past weekend (I'm from New York) visiting my daughter who lives in Capitol Hill. Her furnace went and we stayed in the Morrison House! She laughed when i said the first stop is to walk by Wendy and Alex's house! I've been following your blog for about a year - you make your readers feel as though we are your friends! Wonderful to see in person and just beautiful! Wow, just found this site in searching for Butcher Block counters in older homes; you now have new readers from Philadelphia. Thanks for sharing and from one DIY'er to another, nice job! Hi Alex and Wendy, I found your blog when I was searching around Apartment Therapy for party ideas. It caught my eye because I live in Old Town too and love it love it love it here! Have our paths crossed before? I don't think they have but I bet we have mutual friends. We just completed renovation #4 on our house which is not quite as historic as yours, 1913 or 1915 depending on which paperwork you believe. You've done a beautiful job on your home. Hi Cathleen - Welcome to OTH and we're so glad you found us! Isn't Old Town just the best?! :-) I'm not sure if our paths have crossed, but I hope we have a chance to run into each other at some point. We'd love to hear about your renovations! Hi, my name is Krystina LeNear, and I am wondering if you two have a direct email I can contact you with for a business matter? I would very much appreciate it. I love your site! Yay! I love fellow Clevelanders! I've been reading your site for a while but never realized! I love your site! I have been admiring the outside of your house. Just wondering where you found the flowers on the windows & front door. I'm not sure my earlier comment made it to you, so I'm going to try again: My wife and I are making a headboard from an old door, so we loved your comments on the steps you followed. Our question: is it best to fasten to the wall (thus being forever married to that furniture arrangement), or fasten to the bed frame (does that make it more wobbly)? Hi Bob - Either option would work well. Because we scribed ours to the baseboard molding, we found it's a tight fit by sandwiching it between the mattresses and wall without fastening it to the bed or wall. This isn't a practical option for most people though, and I imagine fastening it to the wall would be more sturdy, but fastening it to the frame gives you more placement flexibility (as you pointed out). Is it possible for post home decor articles here? Hi Wendy & Alex, reading your blog brings back fond memories of Old Town. My father, Charles Parran, spent 40+ years living and working there, where his business was primarily historic buildings renovation. I don't believe there is a street in Old Town that hasn't been touched by my dad. He particularly loved the "skinny" row houses of King, Duke & Prince Streets. His last big project was the home of President George Washington's physician, Dr. Craik(sp). I'm glad to have found your site. Think I'm going to try make the upcycled door headboard! Thanks for the inspiration! Susan. Hi, don't know if you review or recommend books but if you do, I will send you a copy of my new book, The Window Sash Bible. I love the site! I just wanted to mention that Smith Restoration Sash has been renamed SRS Hardware to better reflect the work we are now doing. Thank you for mentioning us in your blog in regards to Sarco Putty and our Storm Window Stays! Could I subscribe to your site? Love your blog and wanted to introduce you to our retrofit mirror frames that work great for home rehabs. If you would like to try out our frames give me a call and we will walk you through the process. I would like to subscribe to your blog please. where can I find the rest of your window restoration? Hello! I've been stumbling across, and enjoying, your blog for years. You can imagine my surprise when I was strolling my new neighborhood and looked up and recognized your front door. We just bought a home in Old Town and are beginning the restoration process (in DESPERATE need of total renovation!!!). I live in Seattle, but my daughter is in DC and will be living in the home when it's finished. I would love to connect with you. Hi Noelle -- Welcome to the neighborhood! I hope all goes well with your renovation/restoration! I'm a home inspector in Winchester, VA and I'm in the process of building a website. I'd like to highlight blogs throughout the year in order to give my clients a broader idea of how to improve or maintain their home. Would you be okay with me adding a link in my page as the "Featured Blog"? Great website. I think the journey you are recording is really valuable, and not just for Americans! Can I reference your website and use one of your photos showing plaster and lathe ceilign being repaired with plaster buttons for a publication for Dublin City Council, Ireland? My name is Matt. I was researching the Internet and came across your website and was really impressed by your passion for DIY home improvement! I thought your website looked really great and wanted to see if I could add some value to it by submitting an article "6 Tips for Creating Curb Appeal on a Budget". The article is professionally written and I can also provide high-resolution royalty-free stock photos to accompany it. Please let me know if this is something you'd be interested and we'll take it from there.